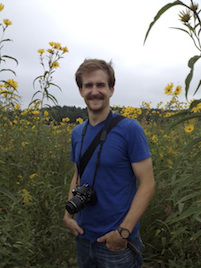 Mike joined the Whitman Lab as a PhD student in 2016 after completing a Master of Science degree at Nelson Institute for Environmental Studies at the University of Wisconsin-Madison, being a lecturer for Botany 100 (also at the UW-Madison), and attending the Microbial Diversity summer course at the Marine Biological Laboratory in Woods Hole, MA. He studied zoology and tropical ecology as an undergraduate student, and his master’s thesis tracked the presence of methanotrophic bacteria and bacterial communities closely associated with freshwater green filamentous algae in Lake Mendota. Mike’s current projects are developing in situ pH pedotransfer functions, measuring the mechanisms by which pH influences bacteria in soil microhabitats, and cultivating “uncultivable” soil bacteria using custom diffusion microchamber devices. Mike also likes to travel, windsurf, and hike with a camera.